Microsoft has launched RTM version of Windows 8. And its have many changes. One of the change is it doesn’t have Gadget like Windows Vista, Windows 7 or Windows 8 Release Preview. I am not a fan of Windows gadget but if you are then here is trick to get back Windows gadget in Windows 8 RTM. 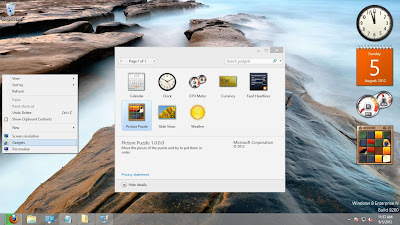 So How to get back Windows Sidebar or Gadget in Windows 8 RTM PC or Tablets?? Step 3: Run “install.cmd” as an Administrator. Step 4: Delete both “files” folder and “install.cmd”. Now you can enjoy your favorite Windows gadget in Windows 8 RTM PC or tablet.